Please note: this offer is only available by calling Saga on 0800 302 9753. 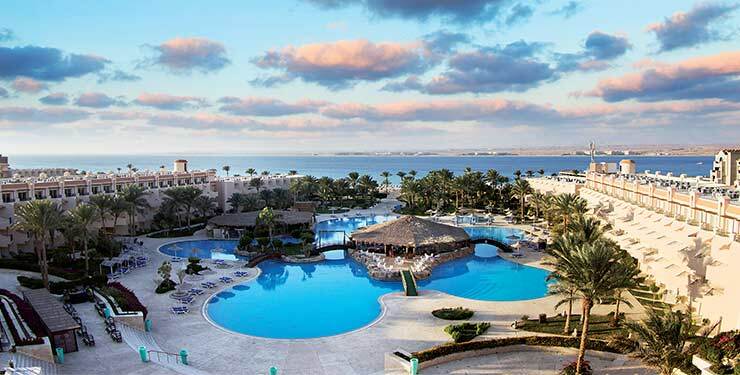 Enjoy all-inclusive relaxation on this great value Saga holiday on the Red Sea coast that includes unlimited A La Carte restaurant dining and a free room upgrade. snorkelling or scuba diving to discover the rich marine life of the Red Sea. This traditional, all-inclusive resort lies on the edge of a vast bay, right beside a stunning, white sandy beach – an excellent spot for diving and snorkelling. It’s decorated in a grand and elegant style and offers an ideal base for relaxing in the sun, or taking part in some of the many activities available here. The hotel is located right on the beach and beside a seven-kilometre promenade which loops around the bay. Sahl Hasheesh centre, five kilometres away, has lovely tree-lined boulevards and various shops. The waters of the bay contain an artificial reef, teeming with marine life. Diving and snorkelling is very popular here, or you can opt to take a boat trip instead. Hurghada airport is a 30-minute drive away. To book please call Saga on 0800 302 9753. 1) All prices are £s per person and may only be available for a limited number of bookings. 2) Flights from Gatwick to Hurghada with the services of Thomas Cook Airlines. 3) Offer for Saga Possibilities members only. 4) Offer applies to new bookings only. 5) Offer cannot be combined with any other offer. 6) Prices include savings as advertised, are subject to availability and may change. 7) Current prices will be confirmed at the time of booking. 8) A reduction of £27 (7 nights), £71 (14 nights) or £155 (21 nights) applies if you do not need the optional travel insurance and additional cancellation rights. 9) For single accommodation or to take advantage of our flight upgrade deals (all subject to availability and extra charges may apply), please visit saga.co.uk/holidays or call for further details.